Alan Carr’s Specstaculars celebrate special occasions, including every New Years’ Eve since 2011. There have also been Summer Specstaculars – one broadcast around the Queen’s Jubilee and another close to the Olympics and Paralympics. Alan Carr’s Specstacular guests have included Justin Bieber, Bruno Mars, Russell Brand, Alesha Dixon, Jack Whitehall, Abbey Clancy and Mo Farrah. In April 2013, Alan Carr’s Grand National Specstacular whipped up interest in the Grand National with a host of celebrities getting involved on Twitter in Alan’s sweepstake promoted on the programme and publicised through the show’s popular social media accounts. 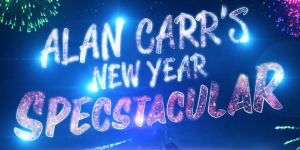 Catch up with Alan Carr’s New Year Specstaculars on Channel 4’s website.